If You Could Be Given One Superpower, What Would It Be? Why? Argument: I have always dreamed of being able to be invisible, so this would be the superpower that I would want to be given. Support 1: I could travel anywhere I wanted for free. Support 2: If I was invisible I would be able to know who was a true friend or not. Support 3: I would want to be invisible because then I could help many people. Thesis: All in all, If I were given one superpower I would want to be Invisible. This is because I would be able to travel for free. Also, I would be able to tell the difference between a good and bad friend and I would be able to help catch criminals. I have always dreamed of being able to be invisible, so this would be the super power that I would want to be given. First, if I were invisible, then I could travel for free. Second, I could tell who was a true friend or not by being invisible. Third, I could help many people by catching criminals. I would want to be invisible because I could travel for free, find out who my real friends are and help people. 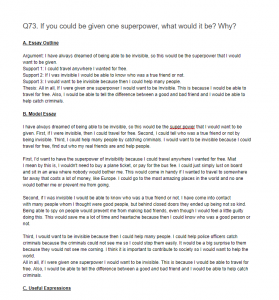 First, I’d want to have the superpower of invisibility because I could travel anywhere I wanted for free. Miat I mean by this is, I wouldn’t need to buy a plane ticket, or pay for the bus fee. I could just simply lust on board and sit in an area where nobody would bother me. This would come in handy if I wanted to travel to somewhere far away that costs a lot of money, like Europe. I could go to the most amazing places in the world and no one would bother me or prevent me from going. Second, if I was invisible I would be able to know who was a true friend or not. I have come into contact with many people whom I thought were good people, but behind closed doors they ended up being not so kind. Being able to spy on people would prevent me from making bad friends, even though I would feel a little guilty doing this. This would save me a lot of time and heartache because then I could know who was a good person or not. Third, I would want to be invisible because then I could help many people. I could help police officers catch criminals because the criminals could not see me so I could stop them easily. It would be a big surprise to them because they would not see me corning. I think it is important to contribute to society so I would want to help the world. All in all, if I were given one superpower I would want to be invisible. This is because I would be able to travel for free. Also, I would be able to tell the difference between a good and bad friend and I would be able to help catch criminals.